1. Make homemade valentines for grandma and grandpa (or whomever). 2. Help the kids cook dinner for the family. 3. Make up a story and color illustrations to go with it. 4. 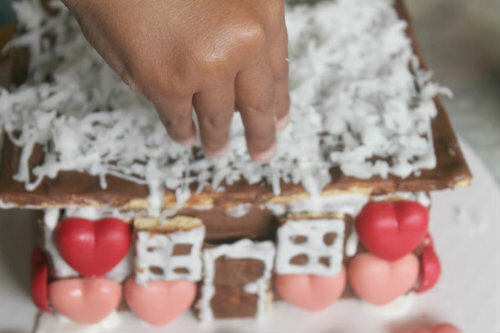 Build (and eat) this candy Love Shack. 5. Explain Black History Month and find items around the house that were invented by black people (e.g. peanut butter, hair brush, mop). Here's a helpful list. 6. Learn how to say "I love you" in different languages. 7. Scour the bookstore for Valentine's Day-themed children's book and read them together. 8. Buy feathers, glitter, sequins, and beads and make Mardi Gras masks. 9. Let them invite friends over to decorate heart-shaped cookies or brownies. 10. Drop everything and have a dance party. 12. Make or buy valentines for kids at your local children's hospital. 13. Take one last trip to the snow or ice skating ring before spring. 14. Have a pillow fight. 15. Think of silly games to play during dinner. Here's one: pick a magic word, and every time someone says that word they have to get up and dance around the table.